Related Event: Create Once, Publish Everywhere Applied—HHS Content Models and Portability, Tuesday, April 18, 2017; register here. 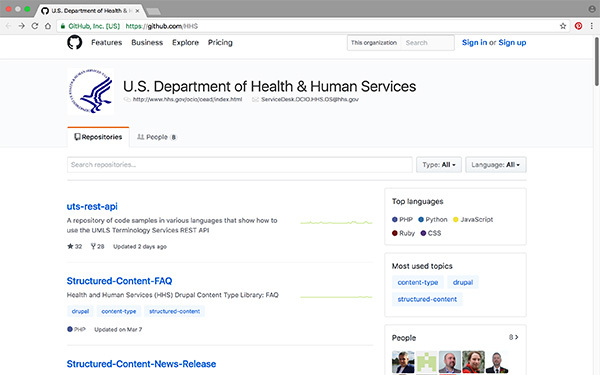 The U.S. Department of Health & Human Services (HHS) is sharing its content models and their related Drupal features for you to use on your sites. Open and structured content models can help you create content that is platform-agnostic, format-free, and device independent. We need to stop creating fixed, single-purpose content and start making it more future-ready, flexible, and reusable. In the age of smartphones, tablets, social media tools, syndication, and websites, the need for modular content is growing. The goal of implementing content models is to have the ability to “create once and publish everywhere” (COPE). Adopting content models can allow your content to be flexible enough to go wherever it is needed. Whether it is syndicated, viewed on a mobile device, or the data is pulled in by another application, it is flexible and therefore consumable. What types of content models is HHS offering? Take a look in the above repositories and see if there are a few content models you can use or use as a starting point in your own efforts. What is a Drupal Feature? A feature is a collection of Drupal configurations that are intentionally grouped together to facilitate a particular use case. These configurations can be used for content type declarations, views, module settings, and roles and permissions, among other things. The content models’ related Drupal features are also being shared, so, if you are running a Drupal site and are looking for a simple way to implement a content model, this is the place for you. Absolutely nothing! HHS is happy to share our efforts in the spirit of collaboration and the hopes that folks will start putting their content in models as well. The future of portable content relies heavily on the adoption of structured content types. If you have content models that you would like to share, please contact Christen Geiler via email. DigitalGov University (DGU) is hosting a new COPE webinar, Create Once, Publish Everywhere Applied—HHS Content Models and Portability, on Tuesday, April 18, 2017; register here. For more information, check out how to create open, structured content, and how it can aid in content syndication. Also, learn about the differences between information architecture and content strategy—and why you need both. Review this post on open and structured content models in government, and see how easy it is to implement them with examples from CDC and NIH. Additionally, you can check out this handy recap blog post of an earlier DGU webinar, What Structured Content Can Do For You (1 hour YouTube video).